Fine Art Shippers is pleased to introduce Kadir ARSLAN, a talented Istanbul-based artist whose incredible paintings deserve wider recognition. 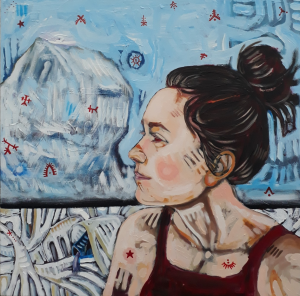 NEW YORK, NY, THE UNITED STATES OF AMERICA, March 30, 2019 /EINPresswire.com/ — Fine Art Shippers is pleased to introduce Kadir ARSLAN, an Istanbul-based artist whose incredible paintings were exhibited at the recent edition of ARTAnkara International Contemporary Art Fair held in Ankara, Turkey on March 14-17. Kadir ARSLAN is a very talented artist, and we would like to recommend his work to anyone who is looking for high-quality contemporary art with a twist! As an international fine art shipping company with agents and offices throughout the world, Fine Art Shippers has the honor of working with many prominent artists whose works are held in the permanent collections of the leading museums in the United States and abroad. We ship fine art for them, support in organizing gallery exhibitions, do art installation works, and provide them with a wide range of other services. Besides, we love to help young and upcoming artists whose incredible talent is unquestionable. We assist them with art logistics and do our best to spread their art and innovative ideas around the globe. One of these artists is Kadir ARSLAN, and we are delighted to share his work with the world. Kadir ARSLAN is a Kurdish artist who lives and works in Istanbul, Turkey. Born in 1986, he has been fascinated with art all of his life, a passion that began with drawing on notebooks and schoolbooks in his early years. When ARSLAN was in primary school, his art teacher recognized the boy’s talent and encouraged him to join the talent exam, which marked the beginning of his artistic journey. 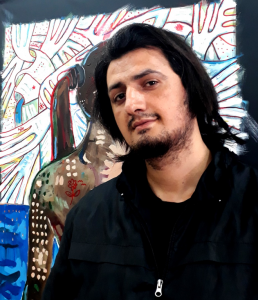 After graduation from Nevit Kodalli Fine Arts High School in Mersin in 2005, Kadir ARSLAN continued his education at Çukurova University in Adana, where he studied at the Faculty of Fine Arts for four years. ARSLAN’s career started right after his graduation from the university when the young artist opened his own studio in Istanbul. However, due to a car accident in 2010, which led to serious health problems, Kadir ARSLAN had to leave art for five years. He returned to painting only in 2015. The same year, ARSLAN opened his studio in Istanbul again and began working as a professional artist full time. 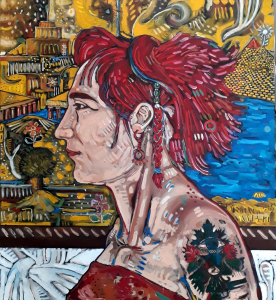 Kadir ARSLAN specializes in acrylic, ink, oil, and mixed-media paintings, with a focus on portraits. The artist believes that art has its own soul and character, and this is exactly what inspires him to create his absolutely stunning artworks. Besides, ARSLAN’s paintings have many symbolic references to Middle Eastern culture and history, which makes them special and undoubtedly very interesting. At Fine Art Shippers, we wish Kadir ARSLAN a lot of success and all the best in his endeavors! He is an amazing artist, and his work deserves wider recognition and greater awareness outside of Turkey. Very recommended!